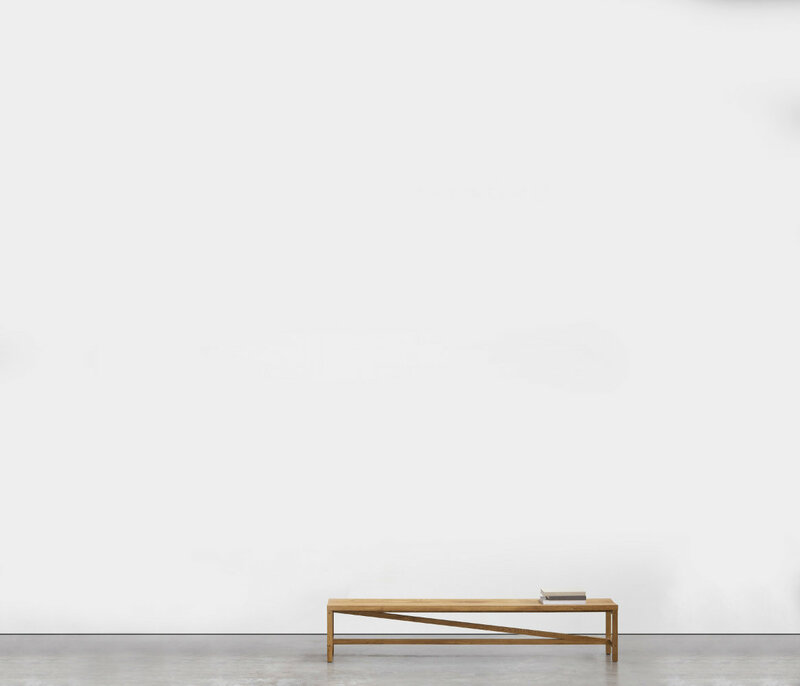 Simplistic and endearing in its whimsical innocence, ‘Find’ plays on minimalistic detailing and shaping to bring forth an image of purity and untarnished virtue. 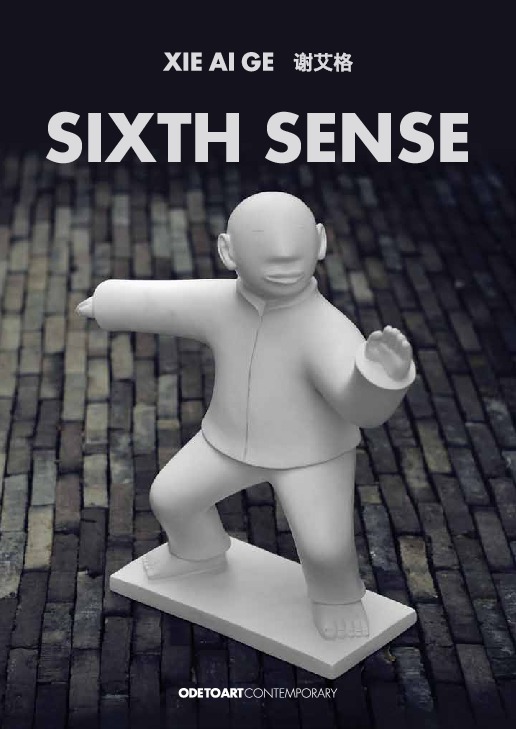 Through the depiction of a simple children’s game, Ai Ge manifests the joys of simple pursuit, and the happiness that lies in the freedom of naivete. Watched over by a bird- the artist’s recurring symbol of freedom, the children play their game with a serenity and carefree spirit that is rarely experienced in modern society. I'm interested in this Tree 7 - Find by Xie Ai Ge. Please advise availability and price. Thank you. 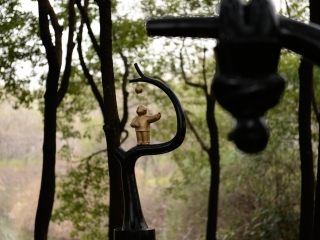 Born in Hunan province in 1977, Xie Ai Ge made her name in the international art world with a host of remarkable works in bronze and synthetic materials. Graduated from the Shanghai Fine Arts College, she was recognized early as a promising young sculptor and in 2005, was acclaimed by art critics for her innovative work during her exhibition in the Shanghai Duolon Museum of Modern Art. The artist has progressed to exhibit globally with a focus on China and the US, where her works are part of many prestigious collections. 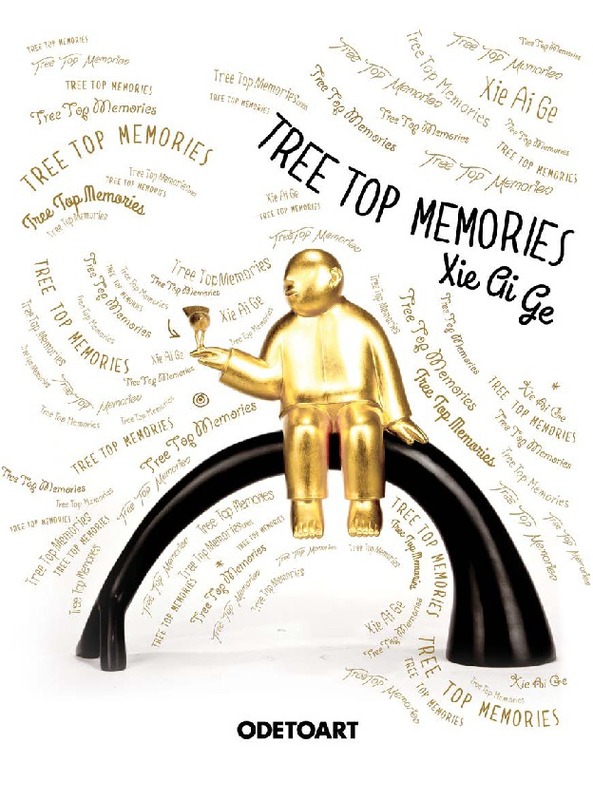 Xie Ai Ge currently lives and works in Shanghai, China. It was in the spring of 2004 that I first came to know Xie Ai Ge. I was then working at the organizing committee of Shanghai Spring Art Saloon when a large-scale art exhibition entitled "Spring" was organized by the Fashion Saloon of Shanghai CITIC Square. With hundreds of participating artists, the art show covered a multitude of art works employing an entirely different variety of materials and works, amongst which I was most deeply impressed by the pottery works created by an artist named Xie Ai ge. I did not meet her when making arrangements for the art show. Her pottery was on display at an eye-catching place in the center of exhibition hall portraying a detailed-oriented yet proportionately exaggerated and slightly transformed realism figure. Ms. Xie arrived at the art exhibition on the date of the opening ceremony. 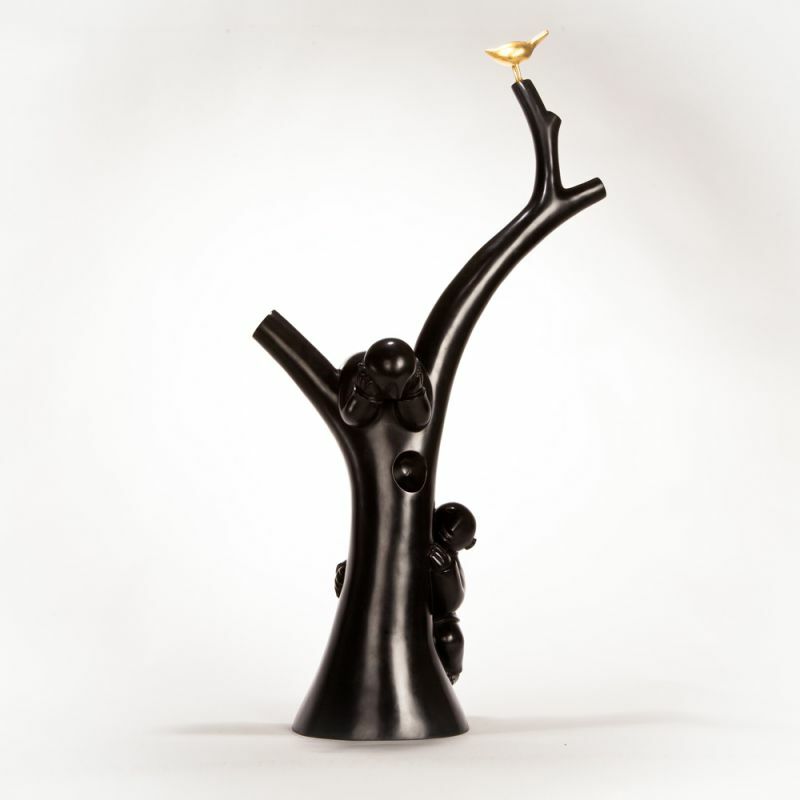 To my surprise, with a long-stemmed Chinese pipe in her hand, she stepped into the exhibition hall hurriedly and put that pipe on the hand of her art works. It turned out that the long-stemmed Chinese pipe was an indispensable part of her works, which has left an unforgettable impression on my mind. Ms. Xie played an active role in almost all group exhibitions planned by me from 2004 to 2005. Her distinctive art works and remarkable style definitely enriched the art materials she used and enhanced artistic appreciation of art shows. Her works on display include such works as A Touching Moment in Early Spring, Spring Tropics, Waking Up Time, etc. The art exhibition entitled "I Have A Date With Spring" has been known as a benchmark in my career as an art show planner. 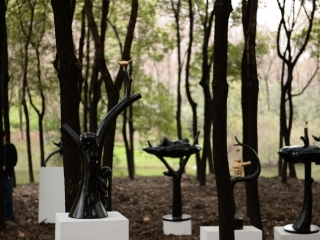 The term "Contemporary Art in China" was not invented or even clearly defined in 2005. Chinese art planners, who were not content with the status quo of the Chinese art at that time, took the lead in organizing a great many influential pioneering artists in Shanghai together, taking bold and drastic steps and coming up with clearly-defined definitions. Despite their relatively immature art works and imperfect materials and artistic languages, they still came up with their own versions and interpretations of early contemporary Chinese art free from the dominance and influence of western art planners and organizers. These artists created artworks showcasing their unique understanding and knowledge of art by insisting on taking a road of their own instead of copying and imitating the art of western counterparts. 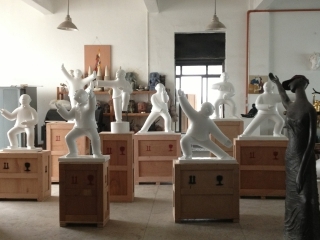 The art planning team included more than 10 artists such as Xiao Xiaolan, Ji Wenyu, Chen Qiang, Chen Guanghui and Kangqing. I recommended art works and sculptures made by Xie Aige, Han Zijian and Yuan Kan. With her dedication and passion, Ms. Xie was the only artist participating in the art show named "Spring Trilogy" planned by me in 2005. The years from 2006 to 2008 witnessed tremendous and turbulent changes in terms of artists and development of an artistic community in China. Because of gradual changes of my art show planning orientation, there were some gaps between Ms. Xie and I, and thus she was not actively involved in my exhibitions and was moving away from my field of vision. However, she had thus embarked on a road leading to brilliant and fruitful artistic creation by setting up her studio in M50, which was equipped with electric kiln making pottery art works. Although I planned very few group art exhibitions at that time, I still paid visits to Ms. Xie's studio whenever I traveled to M50. Moreover, Ms. Xie set up her very first art gallery on the second floor of a building in M50, where I saw art sculptures made of glass steel and cast copper, characteristic of her impressive creativeness and vivid imagination in her pursuit of artistic development and improvement. I am not aware when Ms. Xie started to create sculpture. 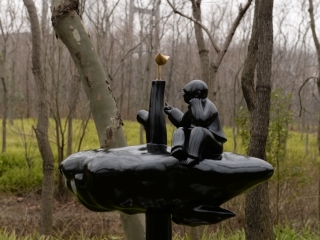 But I am sure the works named "Taiji" are of significant importance in her works. I am of the view that there is much extensive knowledge and profound understanding behind her "Taiji" works. Known as a complicated, mysterious and everlasting subject evolving from the time immemorial, Taiji might represent the most essential and profound concept of ancient oriental culture, which interprets the eternal cycle of birth of all creatures and lives on the earth and has a direct bearing on knowledge from the Book of Changes. According to YiJing Etymology, Yi consists of Taiji, which gives birth to the two appearances, and the two appearances give birth to the four images which in turn lead to development of the BaGua. What do two appearances mean? In a word, they are composed of Yin and Yang, two types of vital energy, which are used to explain the unfolding implications of the universe and all phenomena within, and they can hardly be changed by any human beings in the world. How could we explain and interpret such in-depth and profound knowledge and principles? Profound as the knowledge sounds, we still have to impart and pass it on to future generations in a relatively simple and easy manner. Therefore, Taiji shoulder boxing is one of the easiest ways to interpret the concept of Taiji in real life. Ms. Xie has also come up with her own version of "Taiji shoulder boxing", which is known as the "Silly Roots" series featuring works carrying more relaxed and harmonious facial expressions, which are common characteristics of Taiji boxing grand masters. Compared with her other art works, Xie's 'Taiji" series are a great success. By choosing "Taiji" as the theme of her works, Ms. Xie has selected the most essential and brilliant chapter of Chinese culture. Her works depict and represent the most important philosophical ideas between the heaven and earth such as Yin vs Yang, inner vs outer, movement vs quietness, soft vs hard, visionary vs real, strong vs weak, evil vs justice, dark vs bright, life vs death, etc. The year of 2010 still marked a deterioration in terms of the art market and economic scene. British poet Percy Bysshe Shelley used to say "If winter comes, can spring be far behind? Ms. Xie's works are closely related to the theme of spring. I have been looking forward to seeing her important works at art shows planned by me once more, in which "Taiji" works are arranged like a strong army with unyielding spirit, symbolic of our Chinese nation. With "Taiji", we are able to weather numerous calamities and surmount various catastrophes in the world. When facing land and heaven, the sun and the moon, the thunder and lightning, the tyrannical rain and strong wind, earthquake, flood, nuclear-powered aircraft carrier, or even all kinds of disasters, both man-made and natural, we stand rock solid and rock firm with the very concept of "Taiji" deep in mind. Romance and freedom belong to our human nature, chasing them is like cultivating excellence. Pure heart has been changed by material. Xie Aige's work is trying to illustrate the essence of human nature, unshackling the chains and returning to the nature in order to show the true colors of soul. Within the Chinese sculpting community, which is a melting pot of many trends - classical, modern and port-modern - Xie Aige is a sculptor who deserves a special place,The sculptures of Xie Aige are very characteristic of her way of life, traditional and modern at the same time, while reflecting her Hunan Province roots, they are shaped in a kind of abstract mould that is very modernist. Her creativity is limitless but encompasses mainly women, either sitting in a waiting posture or in faceless freeform groups or playing with a pet. 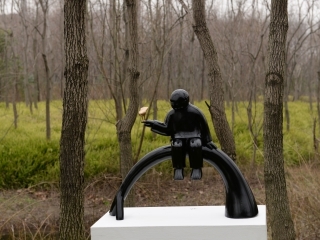 These sculptures are centered on the Chinese women's condition which has become somewhat lost between traditional Chinese culture and the modern requirements of today's life. "I like making portraits, and I can spend hours working on them without feeling time passing. Those figures normally appear with rustic, plain and straightforward profiles. I was born in a remote countryside village, and now live in the metropolitan city of Shanghai. Due to my origins, I naturally cherish simple, rustic and plain things. In my work, I tend to take my countryside life experience as inspiration; traditional garments and fashion as form and media; and my understanding of urban culture and living as a foundation. My sculptures always appear straightforward, without any pretentious mannerisms and fancy decorations, they are just authentic descriptions of the real life of normal common people. I like angels and like to think of women as angels. Today angels are suffering so much from heavy pressures, competition and the violence of everyday life, making them lose their innocence and natural beauty. As an artist and a woman, I really want to share joy and pain through my work, to reveal the true beauty of life. The work 'The Tears of An Angel' is the portrait of my life, and my attitude towards life. I love my life, and enjoy so much working as a sculptor. I enjoy capturing transient moments and trivial things in life and transporting them into my work. The characters appearing in my work are mostly portrayed in a state of total relaxation in total simplicity. They just behave like themselves, with no artifice, make-up, and designed postures. They seem to live in their own world, enjoying their own lives, without noticing time passing and the world changing. It is a captured moment with no dimension of time, space and the environment."